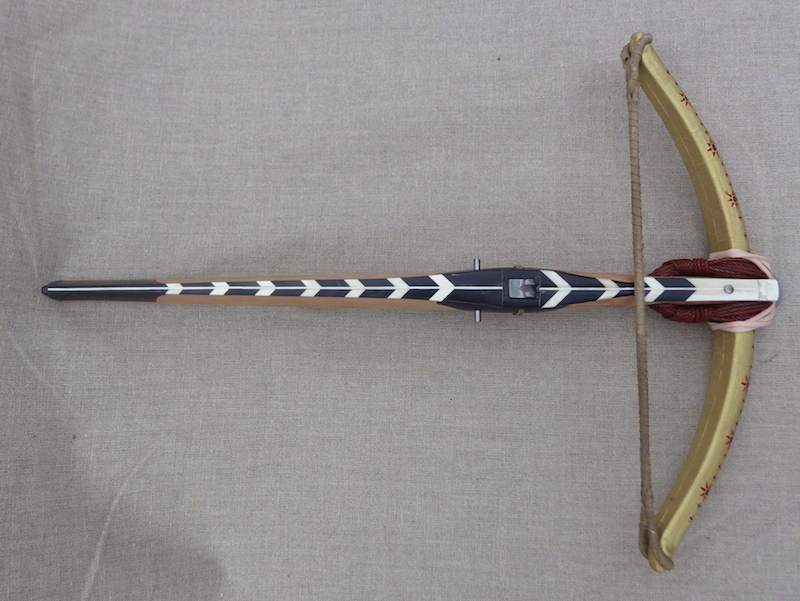 Last year I made two hunting bows for the BBC adaptation of Wolf Hall. 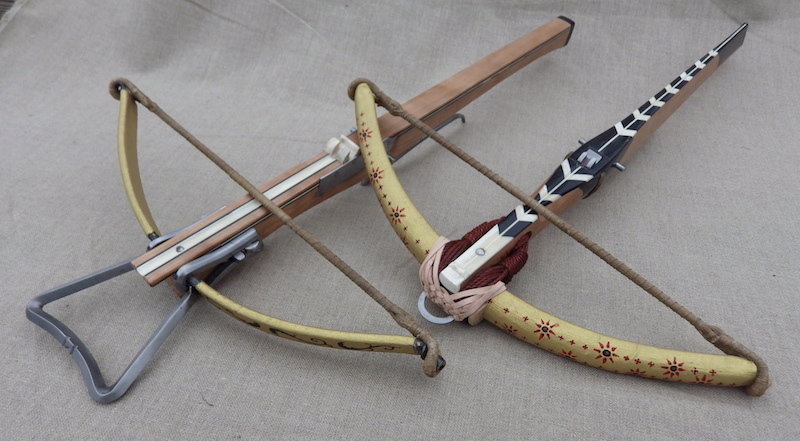 These were both fully functional bows and are made to my usual high standards. I had problems listing this, but it is now back on and the address should be valid. 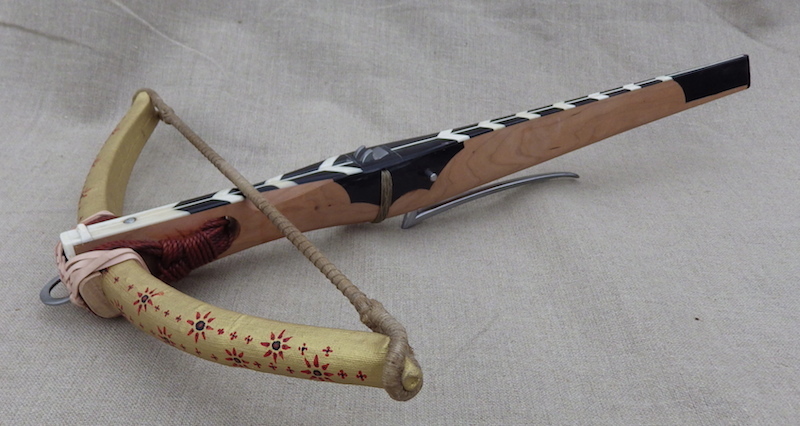 The stock is in cherry, the top deck is in horn and bone and the bow is a 350lb steel bow clad to look like a composite, wrapped in painted linen. The string is linen, the nut and the trigger are steel, as is the accompanying goats foot lever. 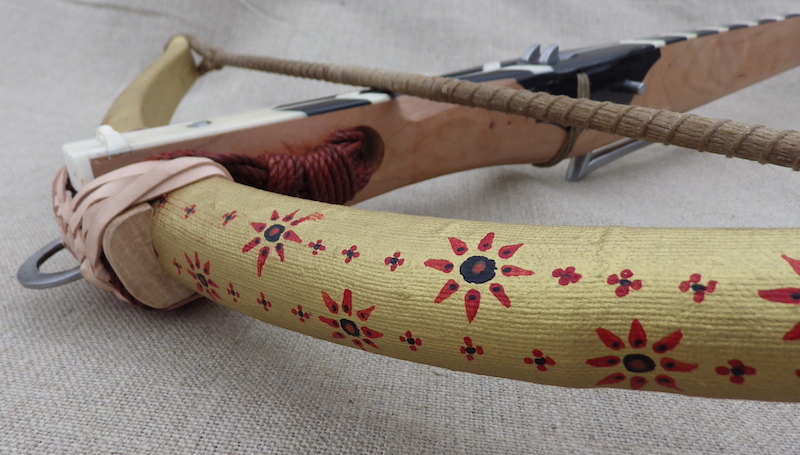 The bow is lashed on with dyed hemp and over bound with leather. 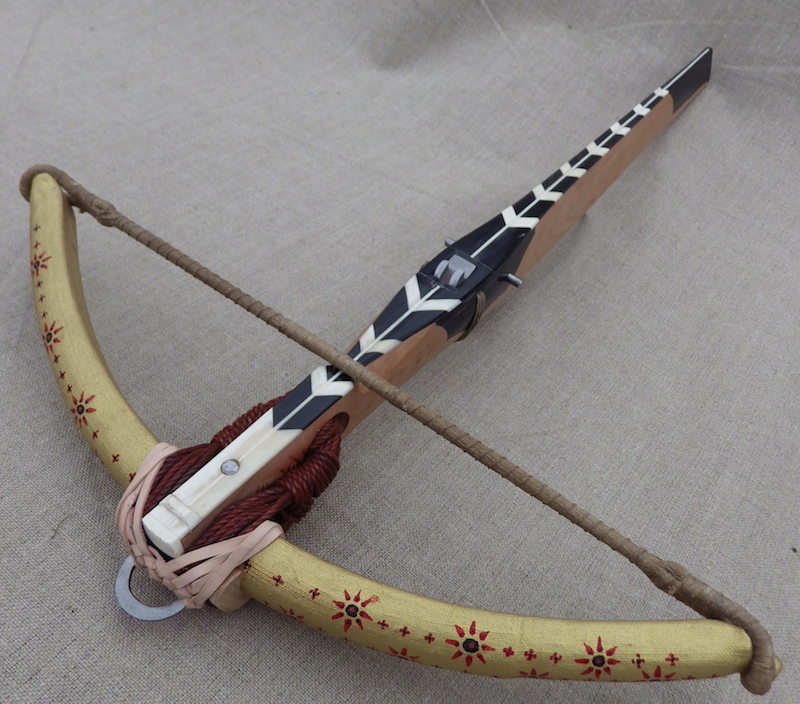 I have put a reserve on the bow equivalent to the price I would usually charge and am happy to ship anywhere in the world. 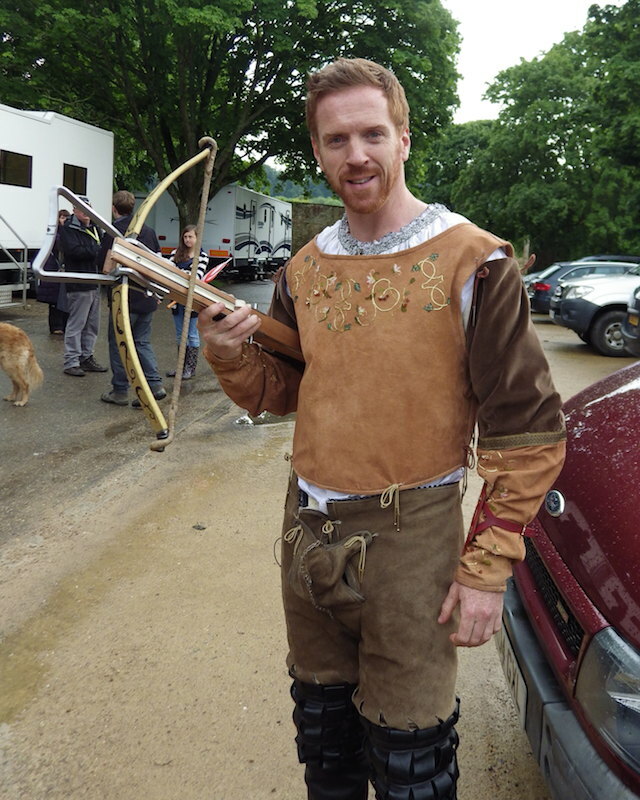 I have included pictures of Damian Lewis holding the other bow and a picture of both bows together. That is a pleasing and delightful piece - Just how many crossbows do you think I need ...... ? Oh and in case Flora's reading; purely a hypothetical query of no practical significance just at the moment... honest. When I saw them on the show I thought they maybe yours. Very classic look and great design on both. Its excellent they where so prominent in the show. Did you get to help with the use of them in the show? Thanks for the compliment. They came to me for various small things like the odd knife and various knickknacks and Henrys and Annes bracers, but they didn't have the money for the bows, so they threatened to hire some from a prop house, so I offered to make these and hire them at the same charge - it made me feel better about the show as I really did like their attitude to trying to get it right where they could. The bows were never going to be shot and so I just handed them over as props effectively but they were made operational so I didn't attend the cross bow scenes, but I taught the 3 principles to shoot from scratch and then ran the shoot on the two days that they were filming those scenes. Still haven't seen the show though, but I have heard good things. I think the most memorable thing was Claire coming to a our house to shoot one lovely Saturday morning and sitting around having waffles with the kids. Still not worked out how to get it onto ebay.co.uk, but I will let you know when I do. Leo, that is two lovely bows! I wish I was in the position to buy one from you. I have managed to realist this on ebay and so the listing below will be valid for 8 days from now.